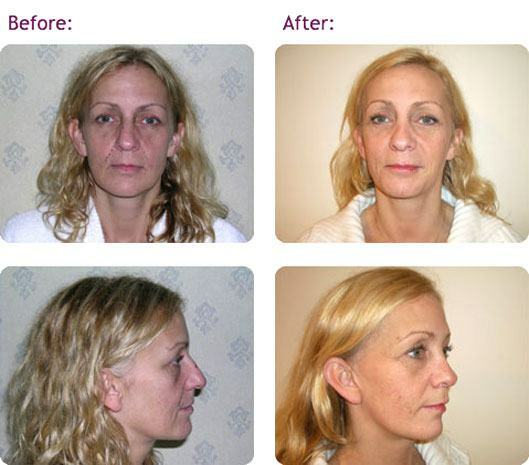 This procedure restores the normal look to the face from the effects of aging. As one ages the forehead lines deepens, wrinkles appear along the corner of the eyes and mouth, lips become thin with lines, cheeks sag with sagging of the jaw skin (Jowls) , folds between the nose and cheek deepens on either side. The neck skin tends to sag and form folds. All this could be accompanied with drooping of the eyebrow or the eyelids. These may require additional procedures. The procedure depends on the areas of the face that need s to be corrected. A standard facelift involves a incision made at the hairline at the temple extending along the curvature of the ear on the front continuing to the back and horizontally back on the hairline. A further incision is made under the chin if correction of the droopy skin and the muscle is required. Occasionally surgeon may use the fat grafting to correct some areas. The procedure is performed under general anaesthetic and may be carried out simultaneously with other procedures like Brow-lift or Upper and lower lid correction. Face will be swollen, bruised and numb after the surgery. Collection of blood under the skin can happen immediately within couple of hours after surgery and may warrant removal in the operating theatre under general anaesthesia. Occasionally wounds have delayed healing specially if they get infected but is very rare. Temporary hair loss at the site of the incision is not uncommon. The risk of injury to the nerve (Facial nerve) is rare but temporary, weakness of some muscles of the face is common and they recover in few weeks time. General anaesthetic complication includes DVT, chest infection and pulmonary embolism. You will have considerable swelling on the first 2 – 3 days. Keep your head up and sleep upright. You could use ice-packs to soothe the skin and help in reducing the swelling. You may be required to wear facial support. You will be able to gradually increase work with gentle activity and no strenuous exercise. Stitches around the ear will be removed. At the end of week 2 staples and other stitches will be taken out. You could return to work and the swelling should have settled and will no longer need facial support. Should be able to start exercise. You will be able to assess the final results and the scars will be soft, become paler and eventually fade.